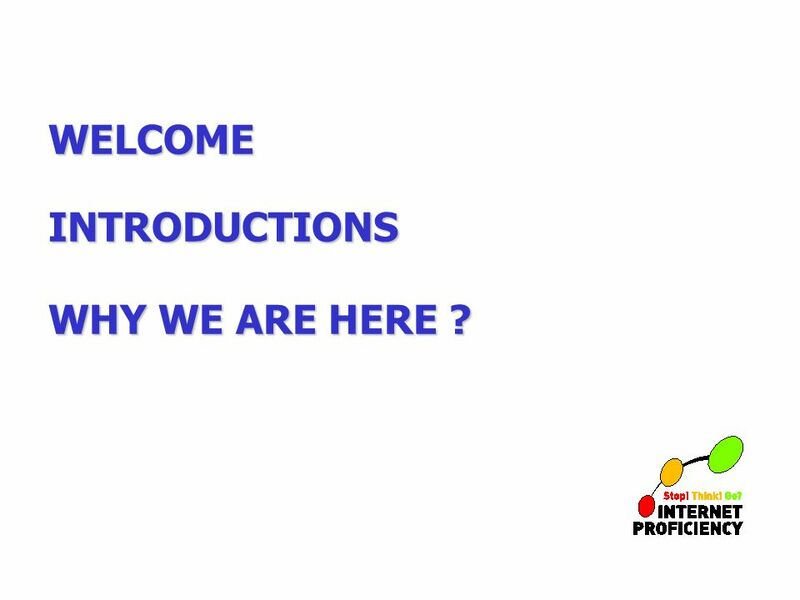 2 WELCOME INTRODUCTIONS WHY WE ARE HERE ? 4 A bit about you…. How many of you have Internet access at home ? What sort of things do your children like doing on the Internet ? What sort of concerns do you have about your childrens use of the Internet ? 5 WHY IS THIS IMPORTANT ? 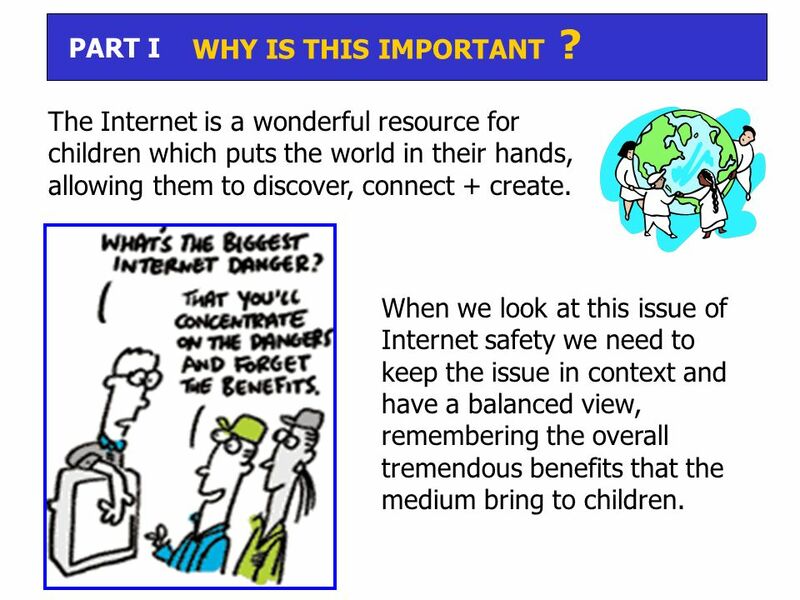 The Internet is a wonderful resource for children which puts the world in their hands, allowing them to discover, connect + create. 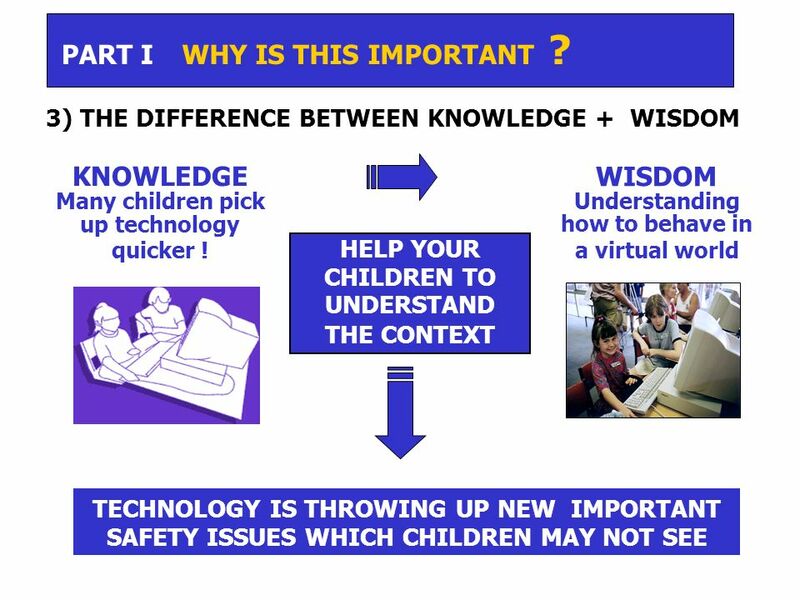 PART I When we look at this issue of Internet safety we need to keep the issue in context and have a balanced view, remembering the overall tremendous benefits that the medium bring to children. 11 Part II Why schools take their role seriously ? 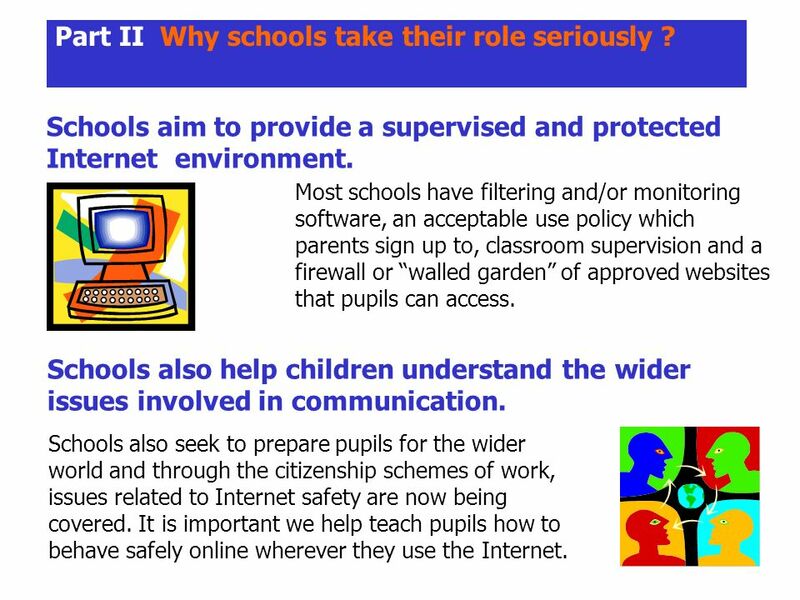 Schools aim to provide a supervised and protected Internet environment. Most schools have filtering and/or monitoring software, an acceptable use policy which parents sign up to, classroom supervision and a firewall or walled garden of approved websites that pupils can access. Schools also help children understand the wider issues involved in communication. Schools also seek to prepare pupils for the wider world and through the citizenship schemes of work, issues related to Internet safety are now being covered. 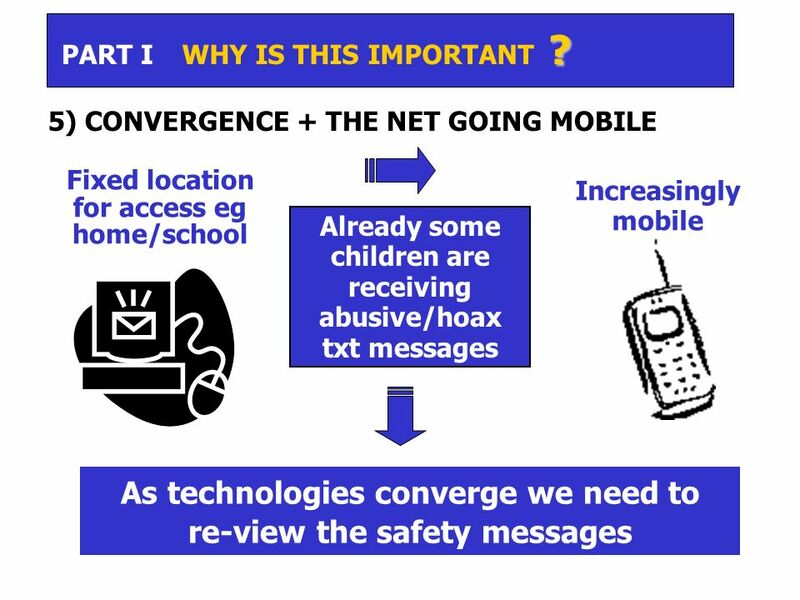 It is important we help teach pupils how to behave safely online wherever they use the Internet. 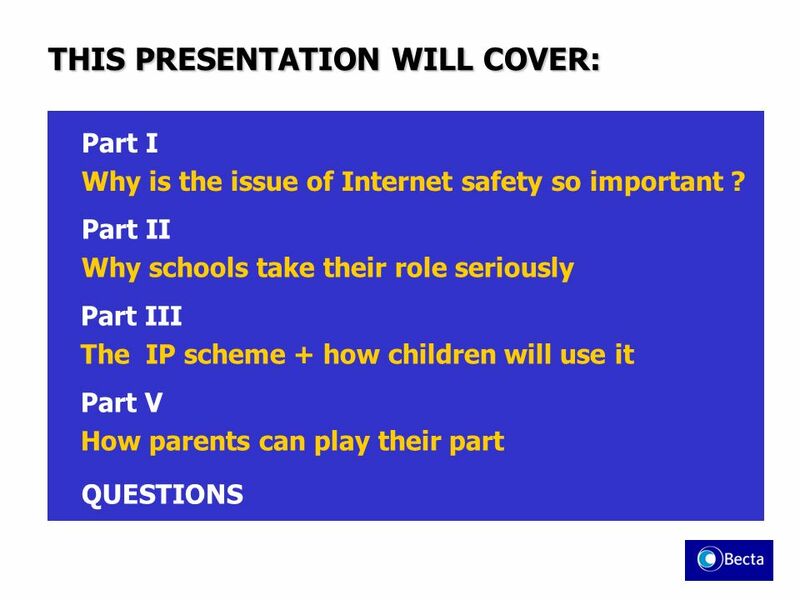 14 Part III The IP scheme + how children will use it ? Teachers guide – giving advice on new applications and the dangers as well as ways to involve parents in this issue. 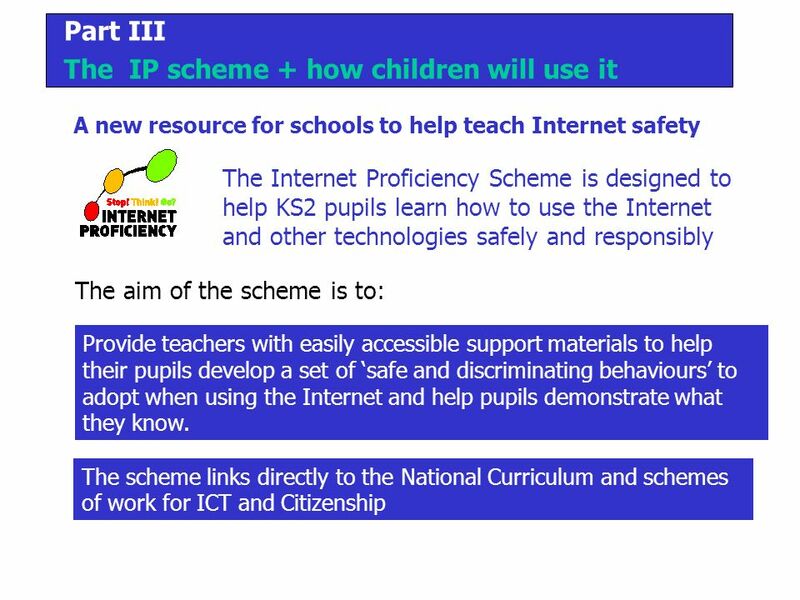 The IP scheme includes: Lesson plans to help pupils look at Interactive services such as Chat rooms, e-mail, SMS, Instant Messenger etc. - Adaptable and differentiated for different levels of experience and understanding. Interactive Cybercafé website which reinforces these lessons see www.gridclub.comwww.gridclub.com Certificate to show understanding – but reviewed. 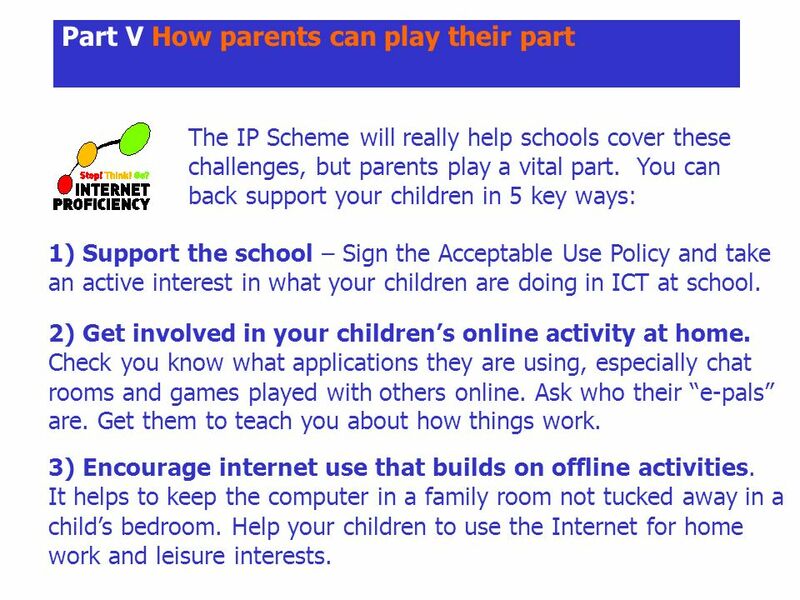 15 Part V How parents can play their part The IP Scheme will really help schools cover these challenges, but parents play a vital part. 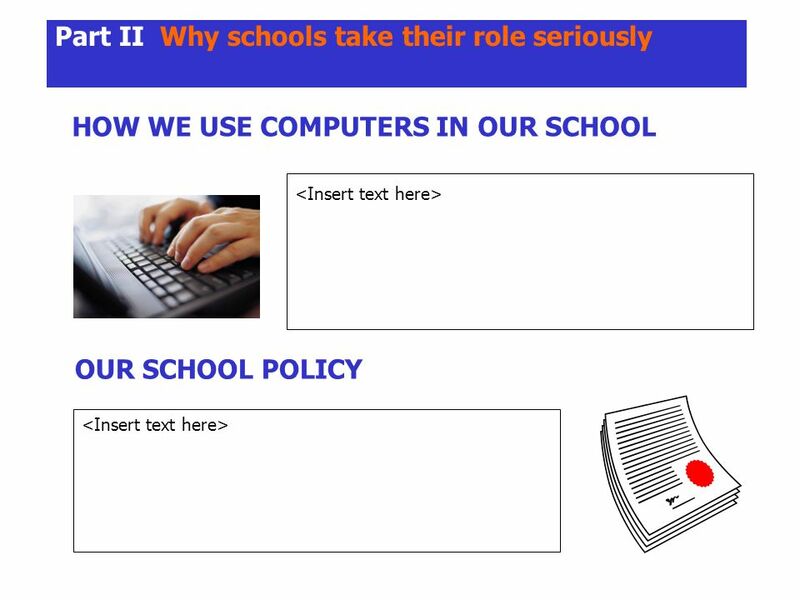 You can back support your children in 5 key ways: 1) Support the school – Sign the Acceptable Use Policy and take an active interest in what your children are doing in ICT at school. 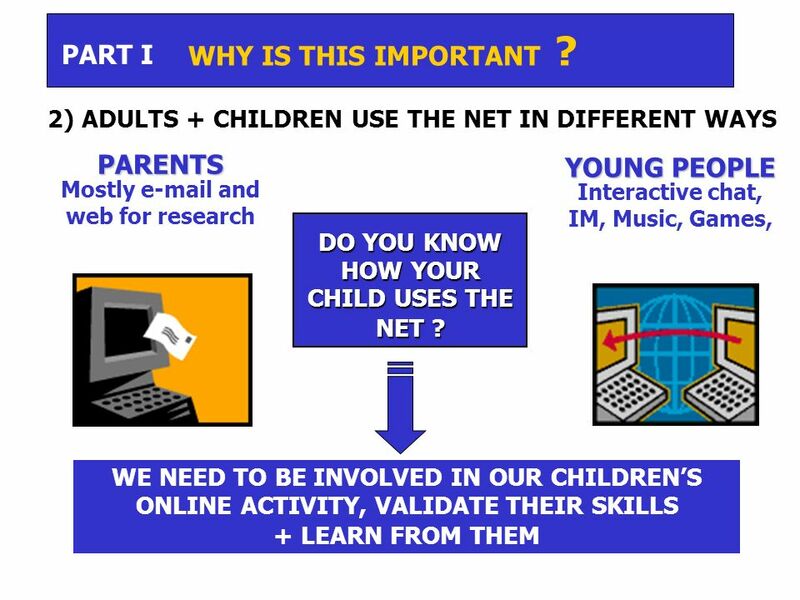 2) Get involved in your childrens online activity at home. Check you know what applications they are using, especially chat rooms and games played with others online. Ask who their e-pals are. Get them to teach you about how things work. 3) Encourage internet use that builds on offline activities. It helps to keep the computer in a family room not tucked away in a childs bedroom. Help your children to use the Internet for home work and leisure interests. 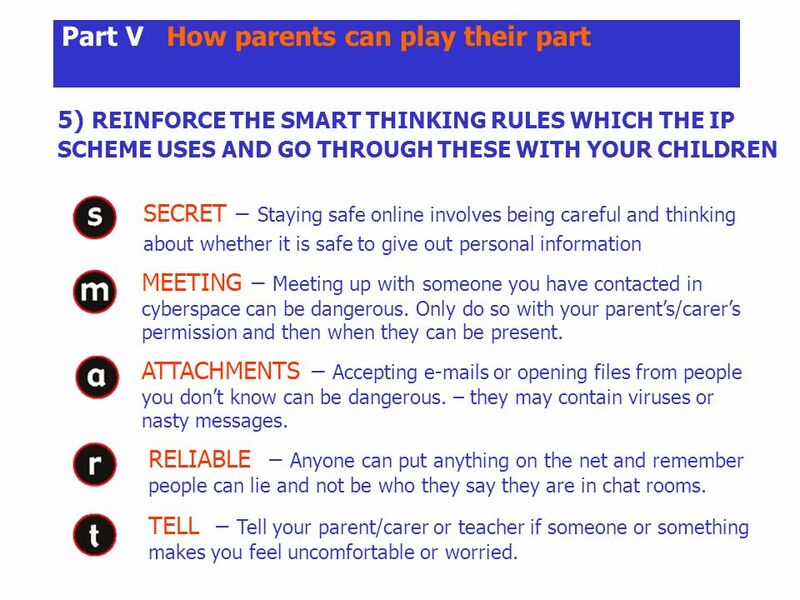 17 Part V How parents can play their part 5) REINFORCE THE SMART THINKING RULES WHICH THE IP SCHEME USES AND GO THROUGH THESE WITH YOUR CHILDREN SECRET – Staying safe online involves being careful and thinking about whether it is safe to give out personal information MEETING – Meeting up with someone you have contacted in cyberspace can be dangerous. Only do so with your parents/carers permission and then when they can be present. ATTACHMENTS – Accepting e-mails or opening files from people you dont know can be dangerous. – they may contain viruses or nasty messages. RELIABLE – Anyone can put anything on the net and remember people can lie and not be who they say they are in chat rooms. TELL – Tell your parent/carer or teacher if someone or something makes you feel uncomfortable or worried. 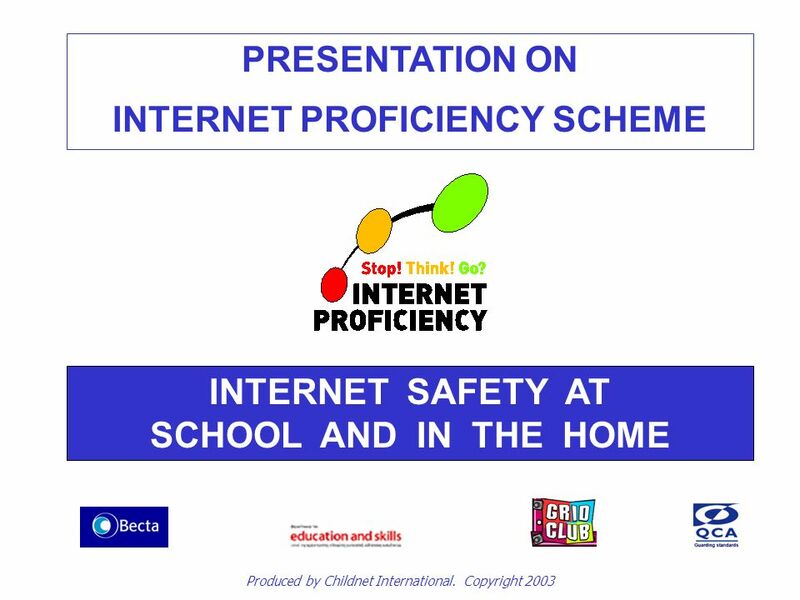 Download ppt "PRESENTATION ON INTERNET PROFICIENCY SCHEME INTERNET SAFETY AT SCHOOL AND IN THE HOME Produced by Childnet International. Copyright 2003." + Promoting the Positive - Responding to the Negative. 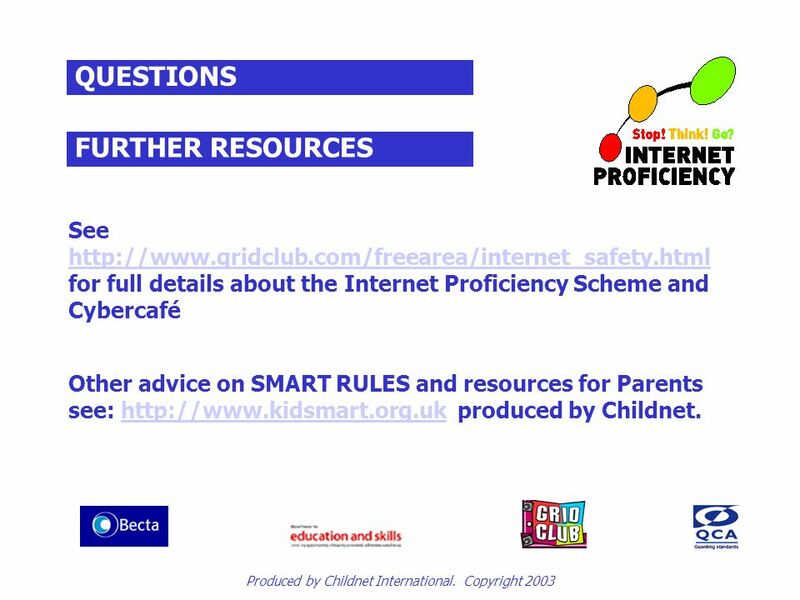 + Internet Safety – Overview and Discussion. + The Internet is a Great Tool The Internet is a great tool and can make your life easier and more fun: It. E-safety and Internet Awareness Hanbury C of E First School. Savile Park Primary School ESafety. Helping to make the internet a great and safe place for children. E-Safety Evening Tuesday 17 th November 2009 © Cambridgeshire County Council. E – Safety Awareness Parents Forum November 2012. S m a r t S m a r t Kieran Bradley JacobJay S M A R T And remember: be S M A R T S Safe Keep safe by being careful not to give out personal information. Internet Safety James Fuller Internet Rules To Remember When asked by friends or strangers, online or offline, never share Account IDs and Passwords. Cyber bullying and internet safety Parents meeting: staying safe online. Safer Internet Day February 10 th Good afternoon Welcome to our e-safety assembly e-safety assembly. 1/15 E-Safety in Initial Teacher Training Secondary Phase. E SAFETY. SOME FACTS A Talk Talk survey of 500 children aged 6-15 in Feb 2010 found: 5% had communicated with a stranger via webcam. 2% have actually. Helping your family to stay in control Living with technology.